There have been social media posts about billing of customers recently, these statements are inaccurate and not factual. 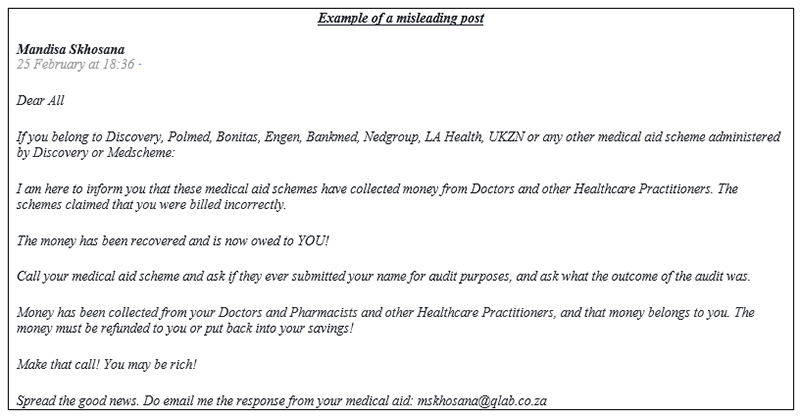 Medical schemes only recover from healthcare providers who ‘over-service’ or ‘over-charge’ their patients from their medical funds for services not provided to members. Many of the funds recovered are fraudulent or false claims. When funds are recovered from these fraudulent and false claims, members benefit as costs of medical aids can be kept stable and affordable. Concerns about any medical scheme organisations can be directed to the Council of Medical Schemes.